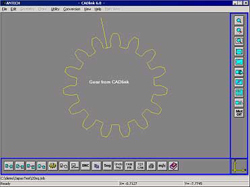 CADlink-8 from Antech is CAD based software for NC programming of CNC WIRE EDM machines. 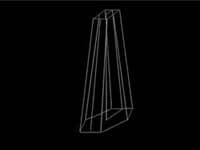 It allows user to take full benefit of geometry making of any CAD software. 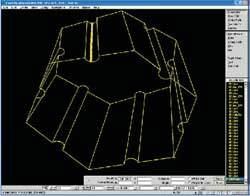 And with least questionnaire it converts dwg files into NC code compatible with CNC WIRE EDM of various makes. It also has various modules like GEAR/CAM and complex shape programming. Compatible with ACAD 2004-2011. Solid edge/Ideas/ProE/NX. BTR RE93 for old NC. 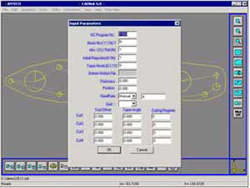 After completing profile drawing in CAD, user can call CADlink module & prepare data for cutter path generation. No polyline concept. Module is intelligent enough to overcome small discontinuities (common problem with CAD users) and generates tool path automatically with erode length and move length. Facility of generating reverse program for more than single cut is also available with this module. Facility of converting Dxf file to Motion is also available. Cutter path file can be converted to IGES or script file, which can be opened as new drawing in any CAD enable user to create Gear profiles. This will be very useful for making any cavities with involute curves. CAD does not have any gear profile generation facility. Cutter path file is universal and is converted to final NC code with this module. Post processorsor SODICK, JAPAX, FANUC, AGIE, SUPERCUT, CHARMELLES, MITSUBISHI, ARD, SMEAR, JOEMER, ONA etc are presently available and generation of new one does not take much time. Post processor module take necessary inputs from the user and generates NC code compatible with CNC control. 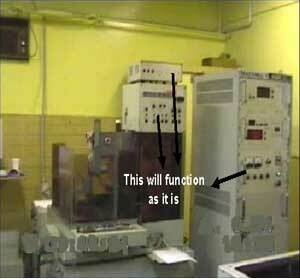 This is a standalone and specialized program for gear profile generation. It takes minimum input from user like module, no. of teeth and generates various parameters like PCD, BCD, TW, PA, RR, TR, MD, RD etc. User is allowed to provide allowances to this & with a press of button, it generates NC code. It also has additional definitions of Gear like with distance measured over teeth and distance measured over rollers. It also has shrinkage option. This can transferred to CAD as well. Specialised module to generate CAM profile with the help of CAD. CAM profile is an intelligent curve passing through given number of points / roller path / points with constant rise etc. Specialized module takes tool cutter path for top and bottom separately and generates 4 axis NC code with X Y Z co-ordinates. This is required for making extrusion dies required for manufacturers of jewelers and aluminum extrusion die manufacturers. It is a PC based CNC controller. If loaded on PC can drive 4 axis of CNC WIRE CUT machine. It operates with printer port and does not need any add on card. 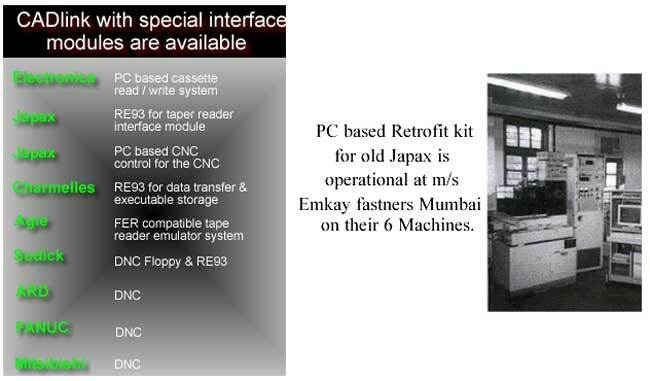 This software is used for running old make Japax CNC WIRE CUT, replacing old NC controller. It works with an interface PCB which is compatible with NC controls of Old AGIE, CHARMELLES and JAPAX WEDM. SmartCAM Advanced Wire EDM™ software provides wirepath for bo th 2- and 4-axis wire EDM machines. It offers the flexibility and functionality you need today plus a long term growth path for your future needs. Like all SmartCAM® applications, Advanced Wire EDM is designed to help you reduce your programming time, improve your machin ing processes, and deliver your customer's parts quicker. 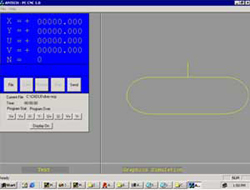 SmartCAM Wire EDM runs with the icon-oriented Microsoft Windows XP and Windows 2000 operating systems. 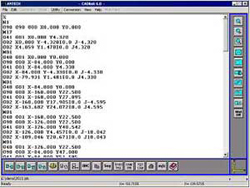 Wire EDM's graphical user interface uses manufacturing terminology and logical operational sequences that ev en first time users will find familiar and experienced users can apply quickly. SmartCAM Wire EDM takes design information from any CAD system. IGES, DXF and CAMCAD Standard™ CAM Connections turn design elements into part profiles properly sequenced for cutting. SmartCAM Advanced Wire EDM provides comprehensive cu tting solutions that help you get jobs done faster and shorten part delivery times, including: l Robust wirepath creation and editing functions enable you to create and edit complex part profiles and create machine-ready CNC wirepath. True 4-axis surface offset is maintained regardless of the wire taper angle. No core cutting allows unattended roughing operation. Visual verification capabilities improve product quality and sav e you machine time and material costs. Verify before you cut. The model will show you both wirepath and “as cut” surfaces. Custom tool graphics help you visualize special setups. For example, you may create graphics for the wire which include upper and lower guides. Dimensioning and notes capabilities help with shop floor documentation. CMI operations, Ballarat ,Australia with 3 JAPAX wire cutters were having dedicated programming station for NC programming. Generated NC programs needed to take to audio cassettes and transfer to NC machines for further cutting. 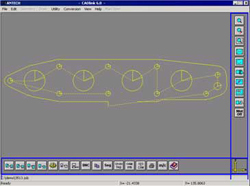 Tool design made in Medusa CAD needed to key in (geometry) again in Programming station to make NC programs. Latest Solid edge data was also required to duplicate. "Antech has done wonderful job of upgrading our JAPAX NC cutters and we are very happy with the job done." Says Mr.Dean, Head of tool design, CMI operations.